When you think about the USDA Forest Service, you probably picture Smokey Bear, trees, and mountains. As part of a new partnership, Room & Board has learned this government agency’s reach goes far beyond America’s rural areas and is deeply rooted in urban forestry as well. In Baltimore, the USDA Forest Service has brought together Humanim, a social services enterprise, and Room & Board in a unique public-private partnership aimed at improving the Baltimore community both environmentally and socially. 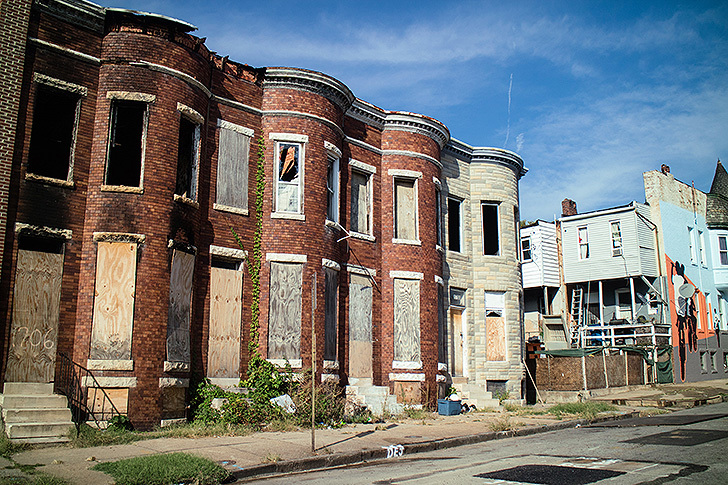 “Our project in Baltimore is thinking about how we can deal with the vast number of vacant homes that we have… in order to restore the communities that we have. And that’s part of our mission with the Forest Service—how can we serve the people and care for the land,” explains Morgan Grove. Grove is the research social scientist and team leader, of the USDA Forest Service Baltimore Field Station. Row homes slated for deconstruction in Baltimore. Crew members from Details Deconstruction carefully remove joists from a row home. Two Humanim entities, Details Deconstruction and Brick + Board, employ people who have barriers to employment, from incarceration to a lack of education. Rather than simply demolishing vacant row homes, Details crew members carefully remove salvageable materials within the walls. This includes century-old floor joists, ceiling panels, and wall lath. In fact, Humanim estimates that for every one job created by a demolition project, deconstruction creates six to eight positions. All while keeping thousands of pounds of materials out of landfills. With more than 17,000 homes currently identified as vacant in Baltimore, there is plenty of work to sustain the program. For every one job created by a demolition project, deconstruction creates six to eight positions. All while keeping thousands of pounds of materials out of landfills. 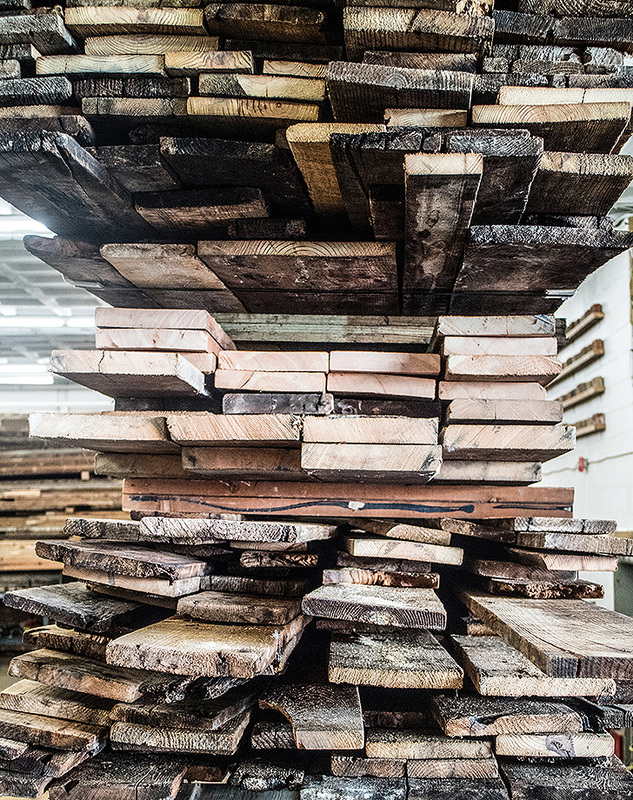 Reclaimed lumber ready at Brick + Board in Baltimore. 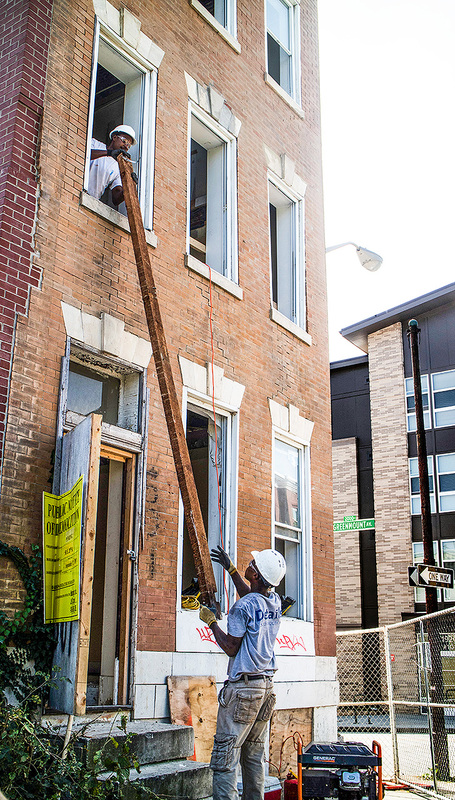 The materials harvested from row homes are brought to Brick + Board to be sorted and prepped for use. 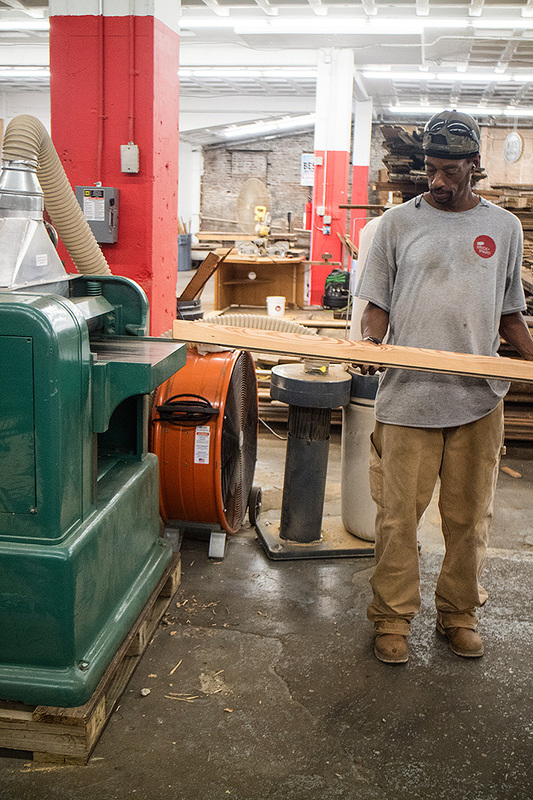 “The yellow pine we get from these Baltimore row houses is old growth or second growth. It’s trees that pretty much don’t exist anymore, so the quality of yellow pine that we get in these 100-year-old buildings is far, far superior to the quality of yellow pine that you’d find at the big box stores,” says Max Pollock, director of Brick + Board. A woodworker at Brick + Board inspects reclaimed wood. That’s where Room & Board comes in. We take the wood that’s prepped at Brick + Board and send it to our American manufacturers to be made into furniture, like our McKean media cabinets and Etting bookcases. Specifically designed to showcase the beauty of reclaimed wood, these pieces close the loop on the deconstruction process. What was once in a home comes full circle to be re-used in another home. For more information about this inspiring story, check out the USA Today article or shop all the products here. Once again, R&B shows why they are one of my all-time favorite companies. I have thought what an amazing thing it would be to do programs like this myself but I never go around to it. Now, there are groups all over that are doing this and it really makes me feel happy that resources of that quality are being reused. If anybody at R&B needs a hand with this program, contact me. I’m in Greenville, SC and I’d bet there are a lot of ways we could do the same thing here. Thanks for the comment! We’re focused on the program in Baltimore for now, but appreciate your enthusiasm for the project. If you’re interest in supporting the mission of Brick + Board or Details Construction, you can certainly donate to Humanim by going to their website: http://humanim.org/donate/. Hi! This is awesome. I’m moving to Philadelphia, back to my home town. I wonder if Philadelphia has some homes as well as people that could use jobs. If you ever need help in Philadelphia, let me know. We’re only involved in Baltimore, but hope that this type of program is adopted in other cities as well! HOLY COW THAT IS COOL! Thank you for doing this for Baltimore. This is a re-emerging city with great potential and that potential can be realized with the help of recovery programs like Brick + Board! Sounds like a great project. However, what happens to the buildings when they’re done with salvage? Are they just demolished, or are they stabilized using new materials? After the materials have been salvaged from the homes, they are demolished and turned into parks for the neighborhood to enjoy! Sadly, that’s not the answer I was hoping for. To J. Downs. After all the wood materials is removed from the building, the remaining brick shell is knocked down and the bricks are recovered and reused. At the end of the operation, 95% of the entire building is reused. In some cases, the land is converted to a park. There is a critical need for open space and places for both children to play and adults to visit. Many of the neighborhoods don’t have parks. In other cases, new affordable housing is built. In the McKean neighborhood, they really needed a park, and they also propose to build a new community health center. Thank you for doing this in the U.S. Saving the planet is a thing now, everyone feels more empowered to help the world now. What a GREAT idea!! I’m looking for a nightstand, and have a Room & Board store near my home; am wondering about whether there’s anything like this going on in or near Seattle? !